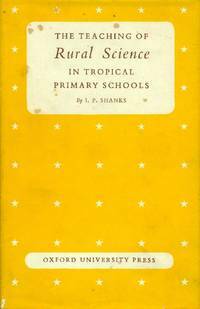 London: Oxford University Press, , 1967. Rilegato tela, sovracoperta (cloth, dust jacket). Molto Buono (Very Good). Beings volume II of the Unesco Handbooks on the teaching of science in tropical countries. With 98 illustrations. 8vo. pp. 204. Molto Buono (Very Good). Sovracoperta con fioriture (Slight yellowing to dustjacket). .